Artwork comes in all forms and sizes. At U.S.Art we recognize that the proper presentation of the artwork is an integral part of the total appreciation of any given piece. Whether we are considering paintings, sculpture or any other type of medium, the installation and presentation complete the experience for the viewer. 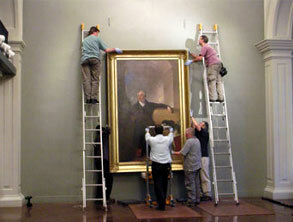 Our teams are highly trained in the art of installation. This not only includes the physical installation of an object but full consideration for its proper placement within a given environment. Consideration for lighting, security, accessibility and safety is an integral part of the planning process.